Example: Take this medicine two times a day. He must take the medicine two times a day. Exercise 1. Mark is ill. Here is what his doctor asked him to do. Write down what he must do. Exercise 2. Read these signs (знаки) and write down what you mustn’t do. Example: Do not walk on the grass. You mustn’t walk on the grass. Exercise 4. Mr Welsh has got a cold. 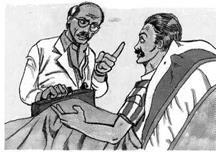 The doctor is telling him what he must or mustn’t do. 7) ……………..eat ice-cream. You 8)............. ……….stop smoking. Exercise 5. Complete the sentences. Use must + one of these verbs. 1. We …………………….. to the bank today. We haven't got any money. 2. She's a very interesting person. You...................................her. 3. I forgot to phone Dave last night. I..................................him today. 4. You...................................to drive. It's very useful. 5. This is a very good book. You............................it. 6. We...............................some food. We've got nothing for dinner. 7. My hair is dirty. I....................................it. 8. I ..................................to the post office. I need some stamps. 9. I have a big problem. You.....................................me. 11. It’s a very interesting film. You ……………………….. it. Exercise 5. Read what Helen and her classmates have to do every Monday to keep their classroom clean and nice. Fill in have to or has to. Exercise 6. Marina isn’t good at English. Give her some advice how to improve (улучшить) it. Example: You have to read a lot to improve your English. The Independent. September 1, 2007 | Complete the conversation with the simple past tense or the past progressive form of the verbs in parentheses.